For the past year, my biggest complaint about TaskPaper for Mac was that Hog Bay Software didn’t have an iPhone version. The developer has finally taken care of that criticism with TaskPaper for iPhone. Like its desktop counterpart, the iPhone version is a solid task-management app that forgoes complex features in favor of an elegant, but surprisingly capable, interface that can handle much more than to-do lists. What makes TaskPaper unique is that instead of strictly formatted to-do lists, TaskPaper uses free-form documents with a few easy-to-remember text conventions. Within each document, you can have projects (separate lists or sections), tasks (items in a project), and notes (text notes within a project). Tap the Add (+) button (or tap return if you’re already editing) to add a new item; tap return before entering text to choose whether the new item is a project, task, or note. Formatting is handled automatically: project names are in larger, bold type; notes appear in gray type; and starting an item with a space indents the entire item, adding a bullet for tasks. I love how easy it is to quickly add content and structure to a document. Making Changes: TaskView’s editing menu makes it easy to modify items. This simple approach to formatting has a number of other advantages, as well. For one, the lack of a particular “checklist” interface means you can use TaskPaper documents for everything from to-do lists to project outlines to lecture notes to brainstorming summaries—if your content can be represented in a list or an outline, TaskPaper can handle it. The other big advantage is that this simplicity is reflected “under the hood”: TaskPaper documents are simply plain-text documents. In any of those documents, a line ending with a colon is a project header; a line beginning with a tab and a dash ( -) is a task; a line beginning with a tab without a dash is a note. 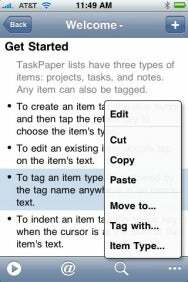 Together with the sync feature (see below), this means that while you can create TaskPaper documents using the Mac or iPhone version of TaskPaper, you can also create and edit compatible documents using any text editor—or even right in your Web browser—and then sync those documents to the iPhone app. Open such a file in TaskPaper on the Mac or iPhone, and it magically becomes a formatted TaskPaper document. But just because this formatting scheme is simple doesn’t mean TaskPaper is feature-limited. It’s easy to find and view only a particular project, hiding others; to move items without having to enter a special Edit mode; and even to select multiple items for action. 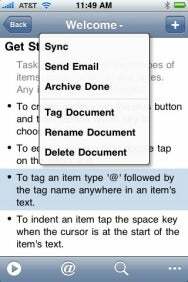 You can also tag any document, project, task, or note by simply adding @tagname anywhere within the item. For example, you could use @today to tag tasks you want to complete today, @work for work-related tasks, and @personal for personal items. (There’s also a Tag With menu command.) In fact, when you mark an item as done, what really happens is TaskPaper tags that item with the @done tag. You can then filter your view to show only items with a particular tag. After only a day or so using TaskPaper, creating and navigating documents feels quite natural; you quickly get the hang of the app’s approach to formatting and the tag and filtering features. Menu Maneuvers: Some actions are hidden in non-standard menus; this one appears when you tap the name of the document. On the other hand, TaskPaper doesn’t support undo (shaking or otherwise), and many useful features aren’t obvious; for example, there are a number of commands hidden in a menu that appears when you tap on a document’s title—an interface element I’ve never before seen in an iPhone app. TaskPaper doesn’t provide the kind of advanced scheduling and task-management features you’ll find in an app such as Things. But for many types of lists, as well as for creating outlines and taking notes, there’s a lot to like here. In fact, it’s one of the few text-entry-based apps I regularly found myself wanting to use more often…if only, ahem, the iPhone supported a Bluetooth keyboard. I can’t wait for an iPad version.